Churches today are characterized by problems, errors, and frustrations resulting from misunderstandings, misinterpretations, negligence, ignorance, and naiveté. It is a lack of protocol within the church itself as well as the body of Christ that has weakened the church in this way. Wouldn’t it be great if we could minimize these types of problems? That is sure to happen with the assistance of Pastor Mesa. 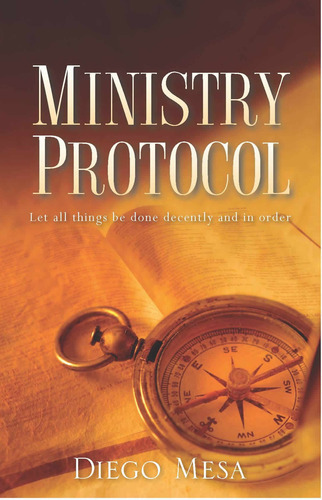 Ministry Protocol is a gold mine of valuable guidelines, including many “nuggets of truth,” for the church and its members to help both restore and maintain order—God’s order. From finances to etiquette to respect, Diego Mesa imparts wisdom from his twenty-two years’ pastoral experience. Church members will learn to improve relationships, and have understanding, accountability, and responsibility. The church will gain productivity, a firm direction, and a unified purpose. That ultimate purpose is to tear down the kingdom of darkness and win souls for Christ.